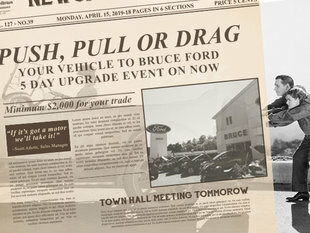 Buying my first new car at Bruce Ford was an awesome experience. Thanks to George for all your help and to Charity for all the paperwork. A job well done! Everyone should buy local! Especially when you can deal with Alain Doucet! What a great experience he gave us. I can't wait to take my little boy for a drive! Thanks Mike! I am very pleased with the service and the salesperson was very friendly and worked hard to get me in my new truck! It was a pleasure dealing with Derek Trefry and Bruce Autogroup on the purchase of our new 2014 F-150. We have bought 4 new Ford vehicles in the past 7 years. This is the first time we felt the salesman and dealership gave us a reasonable price for our trade and a great purchase price without having to shop the price. The purchase and delivery process was prompt, effortless and courteous. We will definitely will be back when we are ready to trade our 2013 Escape!